On October 19th, Lacoste reopened its renovated store located on the first floor of the Unicenter Shopping Center in Buenos Aires. 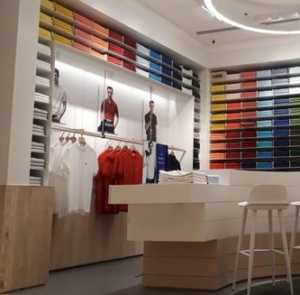 The work took three full months during which Lacoste completely remodeled the space to match the rest of its stores across the world. Expanded to around seventy square meters (approximately 700 square feet), the store has a minimalist feel due to its increased lighting, white tones, and heavy use of light wood and glass in its counters and displays. Currently, Lacoste has about twenty stores in Argentina, twelve of which are located in Buenos Aires, mainly in upscale shopping centers. The other stores are in places like Cordoba, Rosario, Tucumán, Chaco and Jujuy, etc. Lacoste also operates in the nearby countries of Chile, Paraguay and Uruguay. This entry was posted in Lacoste Stores, Shopping by JFP. Bookmark the permalink.